They got off at a station in the very heart of London, and were swept from the train in a tide of besuited men and women carrying briefcases. Up the escalator they went, through the ticket barrier (Mr Weasley delighted with the way the stile swallowed his ticket), and emerged on to a broad street lined with imposing-looking buildings and already full of traffic. I only got this meaning about 'stile' in dictionaries. a set of steps that helps people climb over a fence in the countryside. But it doesn't seem to fit. What does it mean here? 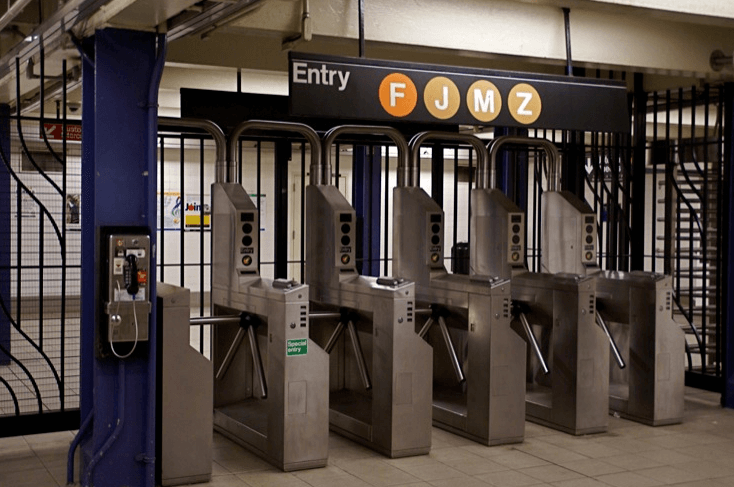 // Andy Byford, the head of the agency that runs the subway and buses, also proposed placing MTA subway station workers at turnstiles and exploring the use of video surveillance monitors warning riders they are monitored. In the passage, stile is being used in the synonymous sense of a modern turnstile. Keep in mind that Rowling's writing style attempted to being an antique, old-English feeling to the modern lives of witches and wizards and often reflected the disparity between the medieval and the modern. From that perspective, using the word turnstile would be boring and mundane (the root word for "muggles," I suspect). Based on the root word stile, a turnstile is something with a turning gate you would climb through. But when you reduce the concept philosophically, a turnstile is a stile with some dude standing next to it intoning, "none shall pass!" In the passage you cite, it isn't a muggle approaching the ticket barrier (a wholly modern contrivance every British citizen would recognize by name), it was Mr. Weasley, a wizard! Befitting the nature of his character, it couldn't be a turnstile, but the more ancient stile, a word many British would also recognize as they exist atop those lovely hedgerow walls all over the place. The British reader would easily understand what was happening, all the while enjoying this warm, fuzzy feeling of nostalgia at the back of their head. So, in this context stile = turnstile, used for aesthetic purposes to foil the modern ticket barrier with the fantasy/medieval feel of the involved character. Welcome to the world of creative writing! What does “former” mean under this context?